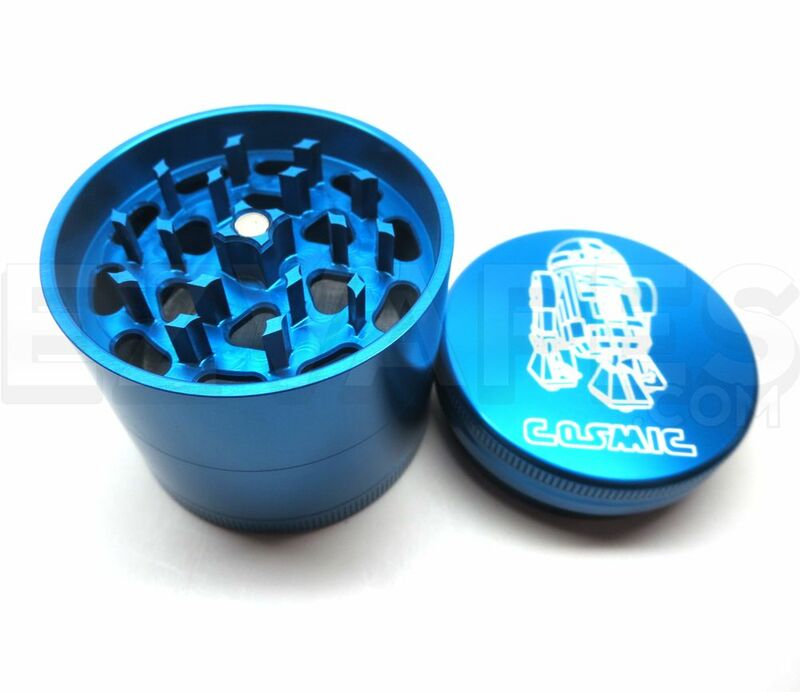 The R2 D2 Medium 4 Piece Cosmic Grinder 2.2 Inch is a limited edition Cosmic Case grinder that sports an engraving of the droid R2 D2 from hit Sci-Fi franchise Star Wars. 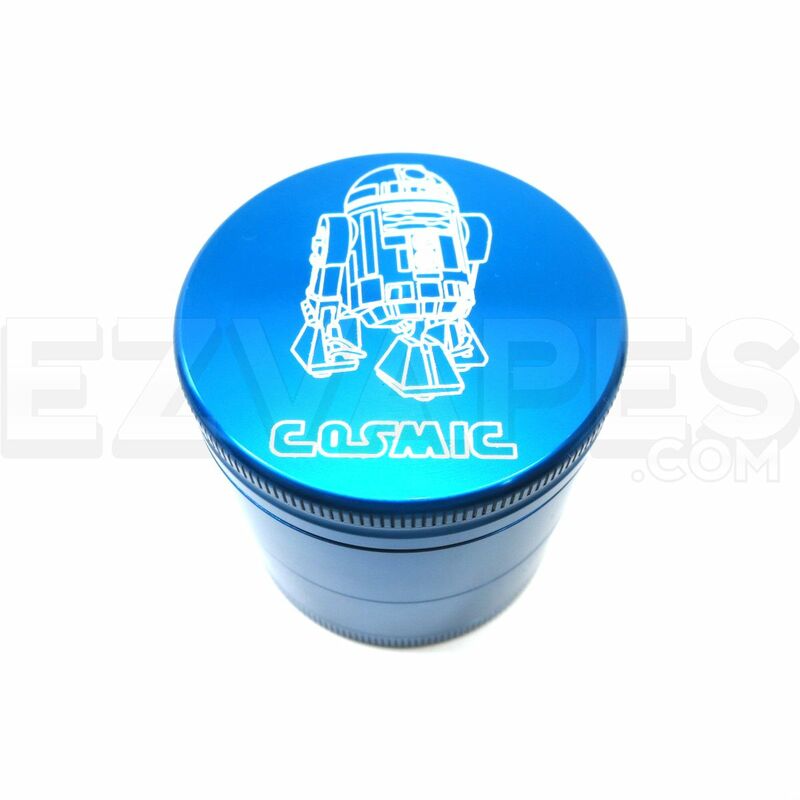 This premium American made grinder includes a 4 part design that together make up a grind chamber, storage compartment with sifting screen and then the final pollen collection chamber. 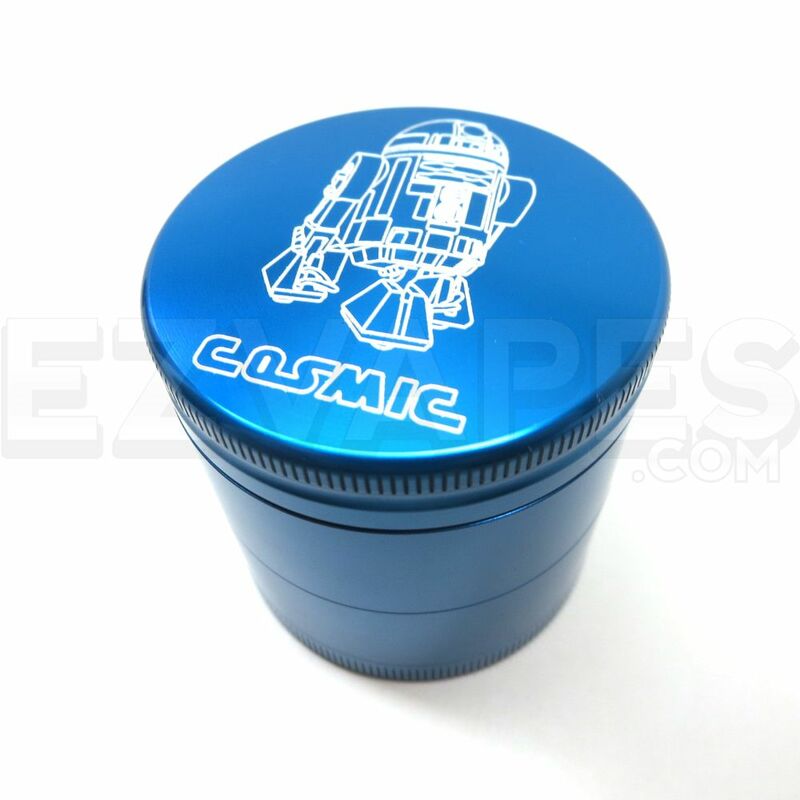 Cosmic's specially designed tooth pattern with strategically placed drop through holes delivers a fine grind each and every time without allowing small BB sized pieces of material to pass through, creating a perfect consistency for smoking or vaping. 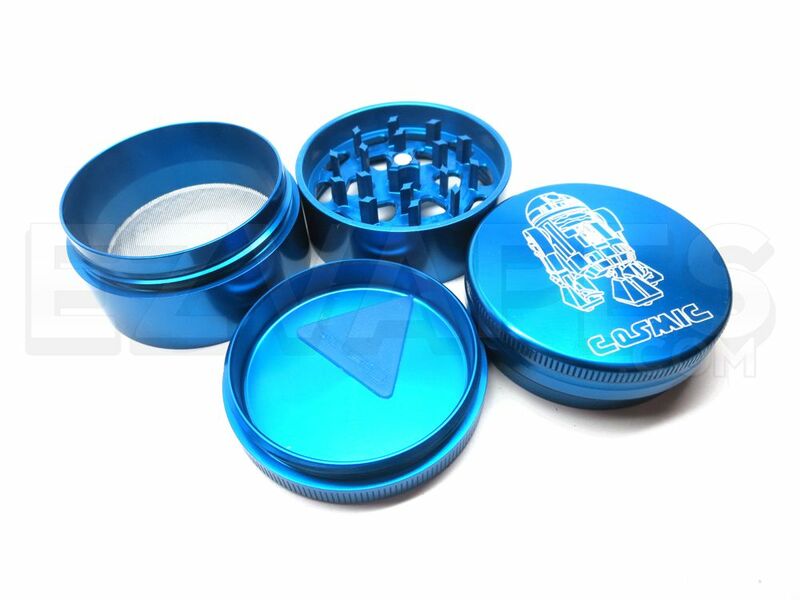 A delrin plastic guide ring sits between the R2 D2's top two layers, this ring helps to create an airtight seal while also ensuring a smooth and effortless grind, requiring little pressure to fully grind through a chamber full of material. Two cylindrical neodymium rare earth magnets are placed within the top two layers, these magnets offer an extremely secure closure that will help to prevent spillage during travel. 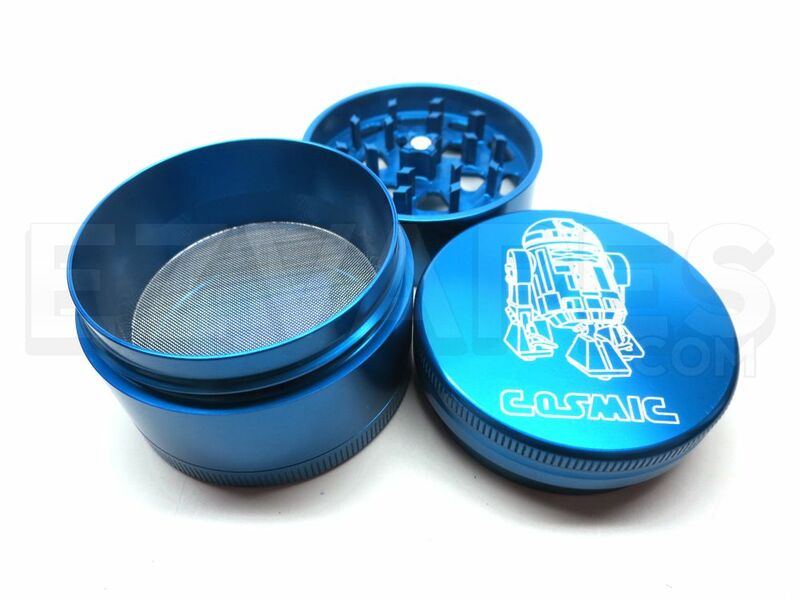 After passing through the grind chamber your ground material sits on top of a fine mesh 316 stainless steel sifting screen that will filter any pollen separated during the grind process down into the bottom tray for simple extraction. Once enough pollen has accumulated use the included Cosmic Case pollen pick to scrape out every last bit, allowing you to maximize the use of your favorite aroma blends and spices.